This documentary captures the overflowing energy and activity of one today’s greatest composers, Philip Glass, and allows us to follow him from New York to London and from Paris to Boston. He speaks about his beginnings, his moving to Paris for two years of intensive study with Nadia Boulanger, his meeting with Indian musician Ravi Shankar and director Robert Wilson, who had a deep influence on his career. The film also shows him at work on the last details of his opera The Sound of a Voice, directed by Robert Woodruff and conducted by Alan Johnson. Éric Darmon’s camera, with its poetic shots and original framings, takes us for a musical journey into seven months of the life of the composer who, rising from the underground scene of the seventies, brought on a revolution in modern theater. When Philip Glass’ music came to people’s attention at the start of the 1970s, it presented an alternative to everything else on offer at the time: rock was becoming more complex and academic, with some of its most experimental forms actually overlapping with contemporary research; vocal music was becoming increasingly overblown, encumbered by symphony orchestras or fettered by the metronome of the drum machine. Meanwhile, contemporary music had turned in on itself, addressing an ever-more rarefied audience of connoisseurs and justifying itself with abstruse, pretentious musicological texts. With its return to a candid, cheerful beat and almost physical feeling for sound, Music in Twelve Parts (1971/74), which was issued on a new label, Virgin, set the tone for a new kind of modern, avant-garde music that did not require lengthy explanations. Glass’ instant, lasting success with an ever-expanding audience not made up exclusively of contemporary music specialists probably explains the permanent grudge the intelligentsia of “Modern” music seem to bear him: from underground, alternative composer, Glass became the acclaimed all-rounder of contemporary music. Some people in both Europe and the USA have never accepted the way Glass’ music transcends the clear-cut ideological divisions of contemporary music, taking its inspiration from a number of sources (including French and Indian) and reconciling the popular with the academic, East with West. These uniquely original features of Glass’ music were fully revealed in Einstein on the Beach, a joint creation with theatre producer Robert Wilson which was staged in Avignon and then Paris in 1976. For many of us, it came as a revelation. This music was like nothing we knew: it was as if we suddenly found ourselves in another world. Glass and Wilson had dreamed up a theatre based on a series of tableaux and images in which the visual and musical elements were of equal importance. Glass’ composition echoed the sublime stateliness of Wilson’s choreography, inviting the listener to join in with the ritual and the contemplation. This style -which was neither simplistic, nor more elaborate than neo-serialism- suddenly made a whole swathe of contemporary music seem outmoded. We were witnessing the birth of a new form of artistic expression, which was both visual and phonic and overturned notions of time and space. It became the music of a generation which was resolutely undogmatic, never tying itself down to one particular style, attracting new audiences and reconciling others with contemporary music. Philip Glass has remained faithful to his underground beginnings. Instead of sitting back and waiting for commissions, he anticipates. Now that he produces his own records, he is entirely free to decide what and how to create: he can form a group of musicians, do a tour and play wherever he likes -in galleries, universities, cinemas or remote villages, leapfrogging traditional distribution circuits and recovering the freedom of a space entirely dedicated to his creation. When he started out, Glass often performed in avant-garde artistic venues, but in recent years he has organised his own tours, performing in some unexpected places. When he travels the countryside with his marquee, with copies of his opera La Belle et la Bête or Godfrey Reggio’s “silent” movie Koyaanisqatsi in his luggage, he is getting closer to audiences and reviving the tradition of stage-show as popular entertainment -the “boards” on which Stravinsky and Ramuz’ Soldier’s Tale and many other works of the 1920s and 1930S French avant-garde were first performed. 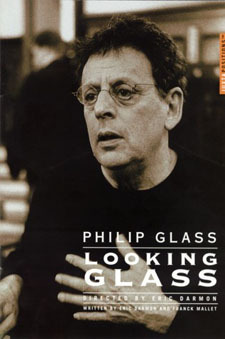 Today, Glass has lost none of his impressive energy and is constantly composing new scores of all sorts, exploring many different avenues, including “traditional” opera, in commissioned works by the New York MET (The Voyage, 1992) and the Portuguese government (White Raven, for the commemoration of the Portuguese Discoveries in 1998). With his incessant activity and sense of theatre, he has managed to avoid the unhappy consciousness of the creative artist in search of an audience. One of the things that makes Glass so outstanding is the way he mixes genres -interweaving opera and instrumental music, film and incidental music, piano and chamber music with consummate panache, even going so far as to create a new art form in La Belle et la Bête, the staggering first example of a “film opera”, and a 3D the video opera MoNstERs of GRAce, a joint creation with Bob Wilson first staged in 1998. The fact that he is one of the few artists to have achieved popular success in their own lifetime adds to his fascination. In Looking Glass, we accompany him step by step from the private world of creation, via the process of writing out the score and initial rehearsals with the musicians, to recording in the studio. At home and in performance, via the people we see him interacting with, Philip Glass rolls out the film of his multiple lives in New York, Boston, London and Paris. The extra Another Look consists of several previously-unreleased items, including an eight-part interview with Glass about his childhood (when he and his brother used to break up piles of unsold 78s in the mezzanine of their father’s shop), his teacher Nadia Boulanger, his early collaborations with Ravi Shankar and Bob Wilson, the composers of the past he owes most to and other composers of his own generation, and his recent work The Sound of a Voice, a diptych of chamber operas with a libretto by David Henry Hwang, which was produced by Robert Woodruff at the ART theatre in Boston (USA) in May 2003. This is followed by two whole scenes from The Sound of a Voice filmed in Boston, and a piano rendering by Glass himself of his Opening from Glassworks, filmed in his New York home. In an interview filmed at the Watermill Center -the multi-disciplinary training and rehearsal centre he founded in 1992, on eastern Long Island, just outside New York- Robert Wilson talks about his relationship with Glass and recalls the landmark shows they worked on together (Einstein on the Beach, the CIVIL warS and White Raven). An ethnologist by training, Éric Darmon established the Mémoire Magnetique production company with Director Xavier Gros in 1982. A witness to the cultural events of our time, he writes, produces and directs many reports and documentaries for French television (including programmes for Ushuaïa, Thalassa and Animalia series). In Au Soleil même la nuit, he explores the creation of a theater show (Tartuffe by Molière) made by Ariane Mnouchkine and Théâtre du Soleil. Frank Mallet is a journalist, author and radio producer who began his career with daily newspapers Libération and Le Monde before starting to write for specialized magazines such as Le Monde de la Musique and Les Inrockuptibles, to which he participated as Classical Music Editor. His career as a radio producer took him to France Musiques (where he produced the Poissons d’Or, Le Matin des Musiciens, Intégrales shows) and France Culture (Entre-temps, Les Chemins de la Musique). He presently works for Classica and also collaborates with bilingual magazine Artpress since 1998. Written by Éric Darmon and Franck Mallet. Colour Grading by Michel Blustein. Sound Mix by Stéphane Larrat. © Arte France – Love Streams – Memoire Magnetique – France 2004. © Memoire Magnetique – France 2005. A DVD produced by Ideale Audience International – Pierre-Olivier Bardet. Translations: Chantal Pulé Traductions, Chikako de Lucia, Victoria Selwyn. Special thanks to Susanna Scott and Carine Gauguin. Juxtapositions is a trademark of Ideale Audience International. Photographs © Marion Kalter © Mémoire Magnetique.